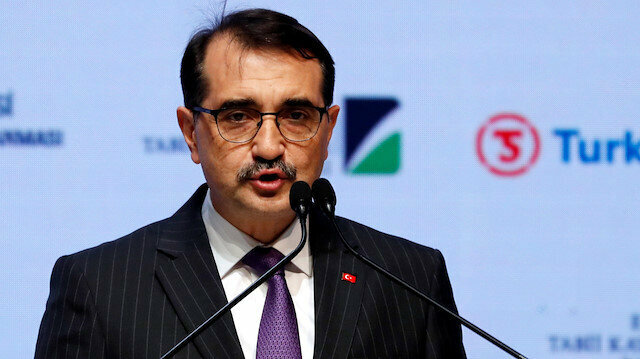 The TurkStream natural gas pipeline project will help Turkey’s aim of becoming a natural gas trading hub, according to Fatih Dönmez, Turkey’s energy and natural resources minister on Monday. Dönmez, speaking at the commemoration ceremony for the completion of the project's sea section with the participation of Turkey's President Recep Tayyip Erdogan and his Russian counterpart Vladimir Putin, hailed the project as the opening of a new page for Turkey’s energy market. Dönmez said that Turkey's aim to become an energy hub country is supported through strong political will and stability in the country. "Turkey aims to become an energy center, where buyers and sellers meet and where prices are determined," he said adding that the country is taking important steps for this goal via the TurkStream project, which he said would be a uniting factor in the countries where the gas is transferred. Turkey is the fourth biggest natural gas market in Europe with an annual consumption of 55 billion cubic meters. The country also has a greater capacity for gas storage and LNG processing, which will help Europe’s gas supply in the future, he said. "The TurkStream natural gas pipeline project is the most vivid example of our vision [Turkey's aim to become a gas hub]. Gas flow from TurkStream will start in 2019 and this will eliminate risks on transmission and transfer of natural gas," Dönmez said. Turkish President Recep Tayyip Erdoğan and Russian counterpart Vladimir Putin attended Monday a ceremony marking the completion of the construction of the offshore section of the TurkStream project, a gas pipeline that will carry Russian gas to Turkey and Europe.Speaking at the ceremony, Erdoğan said that TurkStream natural gas project had many advantages not only for Turkey, but also for its region, neighboring countries.Erdoğan called Russia a "reliable' partner for Turkey" and an "important" natural gas provider that Turkey can cooperate with in the long run.Russia's Gazprom says offshore part of TurkStream is completeTurkStream natural gas pipeline project will be ready to operate in 2019 after tests are carried out, said President Erdoğan.Erdoğan said Turkey's goal was to reach a bilateral trade volume of $100B with Russia, adding that Turkey purchased 387 billion cubic meters of natural gas from Russia since 1987.President Erdoğan said Turkey's solidarity with Russian president and people will pave way for bigger projects for both countries in the future.Eleventh Astana talks for Syria to be held on Nov. 28-29Putin: Turkey is key energy hubTurkey is becoming an important international energy hub as the TurkStream pipeline project becomes a reality, Putin said in Istanbul on Monday.Becoming an energy hub will strengthen Turkey’s geopolitical position, Putin said at the ceremony alongside Erdoğan.Construction of the TurkStream will have a positive impact on the development of the whole Black Sea region and will be an important safeguard for European energy security, he said.Completion of the most difficult section of the gas pipeline testifies to the effective cooperation between Turkey and Russia in very important and complex areas, said Putin. According to Putin, the basis of the project's success is trust between the two countries. "I am sure that the TurkStream, as well as our other joint project -- the Akkuyu nuclear power plant -- will become a bright symbol of the development of a multifaceted Russian-Turkish partnership, and a symbol of friendship between our peoples," he said.The Russian leader said the gas pipeline’s construction is being carried out in accordance with the highest technological and environmental standards.He said he also expects construction of the land section will be finished quickly as well.Echoing Erdoğan’s words setting a Turkish-Russian trade target of $100 billion a year, Putin said he “had no doubts” the two countries would achieve this goal.The TurkStream project is an export gas pipeline set to cross beneath the Black Sea from Russia to Turkey and also further extend to Turkey's borders with neighboring countries.TurkStream's first line is set to carry 15.75 billion cubic meters (bcm) of natural gas to Turkey. With a second line that goes to Europe, the project is to have a capacity of 31.5 bcm per year. The Minister said Turkey will be the first recipient of Russian gas through the TurkStream pipeline, "In total there will be around 32 billion cubic meters of gas flow, half of which will be consumed in Turkey. Turkey will have a major role in the region especially at peak times," he said. TurkStream consists of two lines from Russia to Turkey, with a total capacity of 31.5 billion cubic meters. The first line will carry 15.75 billion cubic meters of gas to Turkey and the second line will transfer the gas to Europe via Turkey.